I've never been a proponent of sharing firm news here unless it's relevant. But this year, it's relevant. There are plenty of changes ahead for me and my firm, and some of them will inevitably land here (but not all at once). After writing and sharing more than 1,400 posts related to communication, this space is starting to feel overdue for more diversity, especially as it applies commentary, curiosity, and creativity. I don't necessarily have a direction per se, but I did invest most of last year on projects leading up to this year. The direction fits right in with some of the advice I shared last year — less talking and more doing. Doing pays dividends. Copywrite, Ink. will undoubtedly remain the hub of my business activity (and I don't mean this blog, but the company behind it). After building this company for more than 20 years, it makes good sense to keep evolving it. However, what we do and how we do it has been changing for some time. Since the beginning, communication and writing services has been at the core of the company. And while much of that will remain, the company also increased its investments in several incubator projects, both proprietary and partnered. With some of these projects maturing this year, we're shifting toward an invitation-only structure: We will decline more prospective accounts than we accept. While some people might think this is counterintuitive given the economy, I am confident the new model is a better fit with a new economy. It will be a better fit with a company vested in creation as much as communication. And, it will be a better fit for me, because too much of the communication industry is settling on client servitude — over-concentrating on things like reach, frequency, and clicks rather than the hard work that makes those things tick. Don't fool yourself. If those are measures, you have the wrong objectives. Carry on without them. Liquid [Hip] is one of our creation projects. What began as little more than a whim 18 months ago has grown steadily from a few hundred visitors a month to tens of thousands. I still consider it a hobby of sorts, but only because it's fun to be immersed in creative works. It also gives me a venue to experiment with social media without any of the constraints that are sometimes imposed by clients. If you've never visited, Liquid [Hip] is an online review site, which only reviews things the reviewers actually like. There is a heavy emphasis on music and books, but our editorial rotation allows us to pick up apps, film, fashion, gadgets, games, and good will. It's not for everyone. We cover cool, not popular. Currently, we're busy corralling all the reviews, but there are some other exciting prospects for Liquid [Hip] in the months ahead. I'll share some of these developments as they mature in actualities. Celebrating Legacy. Last May, I had the good fortune to meet one of the most highly decorated police officers in the history of the Las Vegas Metropolitan Police Department. Retired law enforcement professional Randy Sutton envisioned an online legacy archival system after several deeply personal experiences made him reassess life and invest two years into developing something that could add value to other people's lives. Celebrating Legacy was the outcome. While there are several other great people involved (to be introduced in the future), what originally started as a communication project quickly evolved into a creation project. Borrowing from years of behind-the-scenes experience with several social networks, I became a lead project architect. Currently, Celebrating Legacy is pre-alpha with internal program testing slated for January. We'll immediately follow this up with an invitation alpha phase. There is still some dust on the site itself, but you are more than welcome to visit the front porch or submit an application to become an alpha tester. At its earliest stages, I anticipate alpha testers will have access to 80 percent of 'year one' services. Yorganic Chef is a hybrid creation-communication project for our firm, which is also maturing this month. The site will sport a placeholder page until about mid to late January. Once launched, Yorganic Chef will provide people a place to order ready-made gourmet meals in the Los Angeles area. The meals will then be delivered to the customer's front door on a schedule convenient for them. The venture is the brainstorm of Nick Diakantonis, who has 25 years of culinary and entrepreneurial experience. Years ago, he was one of the founders of Pasta Ditoni's (a wholesale pasta distribution company) as well as Piazza Market, which is located in Ohio. Los Angeles will be the first of many markets where Yorganic Chef will open. Initially, Diakantonis planned to make Las Vegas his test market until an angel investor of sorts lobbied for his company to start in Los Angeles. Having seen the menu, this is the right project at the right time and in the right market. Odds & Ends. The projects above represent the forefront. Personally, I have a book to finish this year (sigh, maybe), a children's book to illustrate, and two concepts for board games that were the direct result of hanging out too much on Kickstarter last year. This creates a nice array of options, and some of it has even prompted me to invest some holiday downtime into rekindling dusty skill sets in fine arts. At the same time, I will stay on with UNLV and have accepted an invitation to speak at the Nevada Parks & Recreation Society conference in April. The topic will likely be social media, perhaps a parsed version of last year's social media class (the deck almost refined enough to share online). And, although I am extremely reluctant to come out of retirement from politics, I have been asked to work on a Nevada State Senate race, two State Assembly races, and one Congressional race (as campaign manager on any of them, if I want it). We'll see. These aren't decisions to make lightly. I've had some wonderful opportunities to meet hundreds and thousands of people in the seven years since I started this blog. Not all of them are in communication, but it's the communicators who need to hear this the most. Unless your company is doing, social media is an exercise in spinning wheels. Sure, there are a few communication blogs that become popular enough. But most of them eventually fade away. From my original 2005 blog list, not one remains. From my Fresh Content Project list last year, maybe 20 percent are viable today. And if I added all the communication blogs up, maybe one in 1,000 monetize social media into speaking, authoring, or consulting. Keep that mind, especially when you ask yourself what you are going to write about this year. It's the wrong question to ask. Unless you teach social media, you really need to be doing something else. And then you can write about that. Care to join me? 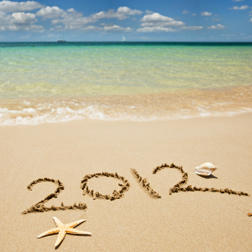 I know 2012 will be great year. I hope it is for you too. The first social media story (Friday) this year runs down a few social networks you've forgotten about and whether or not their recent changes are enough. And then, on Monday, I'll follow it up on why politics cannot be measured by social media or media relations as much as grass roots. Writing Occupations Are Changing. Are You Changing With Them? If 80 Percent Of People Won't Change, Why Force Them? Thinking Big: Why Not The Moon? Striving For Leadership: Martin Luther King, Jr.